My post apparenrly endes up in the blog's spam filter, so it took a while, but it's now online. I would love to quote your posts from their blog, since they represent a very well articulated reasoning concerning, what you call there, human output of the scores. That's totally fine by me. Thank you, OCTO, I think. I have to say that I totally agree with John and Jeremy about the inferior quality level of computer-based engraving to the manually engraved scores of the past, Henle’s output included. Of course it’s true that Henle, as one of a few publishers in the very high end of the music publishing industry, still releases scores that are well above average in quality. Then again it’s sad that the the advent of computers seems to have had a negative effect on the quality level over all, rather than a positive one. As John points out, there seems to be no good reason for this development, given the precision, flexibility and efficiency afforded by today’s notation software. Speaking of resolution with regard to the plate engraved, offset printed scores of the past doesn’t make much sense, There are no pixels involved in this technology, and so the concept of resolution doesn’t apply. It’s totally legitimate to prefer digital over analogue with regard to photography or audio, but it’s very difficult to argue that one is objectively better than the other. It depends on what you emphasise – what you deem important. In any case this debate over manually engraved vs. computer-engraved scores are much more analogues to mass-production vs. hand crafted products. After all, the old techniques of manual engraving required well-educated craftsmen, while nowadays, anyone can reach a reasonable level of quality using software and their home computer. You may of course prefer IKEA over your local cabinet maker, your average clothing store over your average taylor or the super market over the farmers market, but chances are, you’d have a difficult time defending your choice purely on the basis of quality. On the other hand, the superior quality level that Henle is associated with is very difficult to achieve, even with the help of modern technology. It requires a vast knowledge of craft comparable to that of the old plate engravers. And since most developers of notation software are not professional engravers, it requires engravers that are secure enough in their abilities to not rely on the default settings and suggestions presented by the software. It is pretty clear that Henle, like most other publishers, have fallen into the trap of relying too heavily on software defaults and automatic behaviour. Perhaps this is due to lack of knowledge on the part of the engravers or perhaps it’s a matter of efficiency. In any case, it’s very unfortunate. Very well articulated answer, hits in the middle. They simply do not understand that musicians are accustomed to the appearance of scores that have been since ever on their sands. The new technology is just very very recent. On the other side, the manual editing (in engraving) is absolutely necessary and will always be necessary, and if everything is reduced to the fact that the software solves the very complex graphic outlook of music, I think it's only a downturn on the horizon in the quality of music editions. I know that their releases have not been completed without manual intervention, but the software gives us an initial set-up that must be "broken" in order to achieve a satisfactory goal. If you sit in the tractor and want to pretend that it is a Mercedes, no matter how you paint it, it will still be a tractor. The tractor must first be broken down in order to make a Mercedes. They look like they drive a tractor, pretending to be a Mercedes. All new editions are just shame for many publishers, why not just to re-print the old plates? Thanks, Knut! As OCTO so rightly said, your comment hit the mark perfectly. And I think that OCTO's tractor-Mercedes analogy is not only amusing but also right on target. I should have mentioned that I have only been able to get my comments out of their spam filter by sending them also to the editor, who has kindly put them online. I thought that was just a problem with my internet provider but it seems to be a larger issue. I also expressed a wish to be able to post examples, but they do not allow this and have no plans to do so. We might do some more of what Schonbergian has started and post examples here. It would be interesting to see some before and after shots of these editions that they are redoing. Thank you, OCTO and John! I had to put a bit of thought into how I could contribute to this discussion. It's very nice to know that it paid off. I totally agree with OCTO that the decline in the quality of musical scores is largely a matter of attitude. It's also a complex problem of decreasing revenue, dwindling knowledge and mass-market influences among other factors. Hopefully, at least some publishing houses will be able to find their way back and salvage their reputation. I'm just worried that the demands of most of their customers have simply adapted to the situation, in which case there's little incentive for them to change their ways. 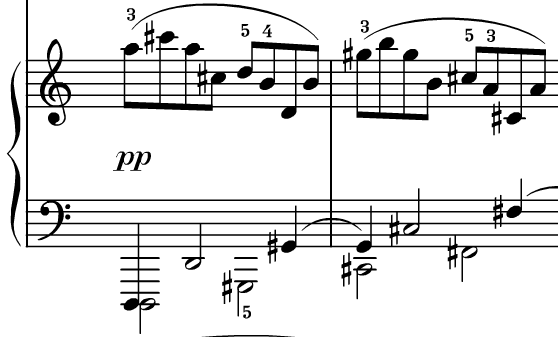 Also, looking at that score close-up, has Henle changed their music font? At least the treble clef looks different from their normally very distinctive look. i have few Henle's edition .. if i look closer some of them were different, i guess they have several engravers with different music font (similar) but not exactly the same.